Click the “Download Here” link above to print our spooky downloadable. You’ll find a frighteningly fun list of Halloween scavenger hunt items! When your party ghouls and goblins head out trick or treating, send them off with this scavenger hunt. Check off each item they find on this list (or take a picture of it!). Plan a Kids Halloween party. Spaghetti and Eyeballs for Halloween dinner. 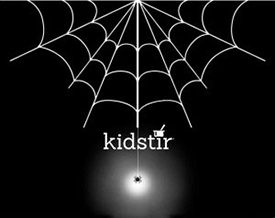 Carve a Pumpkin with Kidstir Halloween Patterns.